Oh, Mother Nature, you are such a tease! Earlier this week, we were ready to bust out shorts and flip flops. Today, we are buried under a mountain of snow. All schooling and community activities have been cancelled today, and we are cooped up indoors. Blah! Usually when we are stuck indoors, I like to test out new recipes. Since it's cold today, soup sounds like a fun and warming recipe to try. 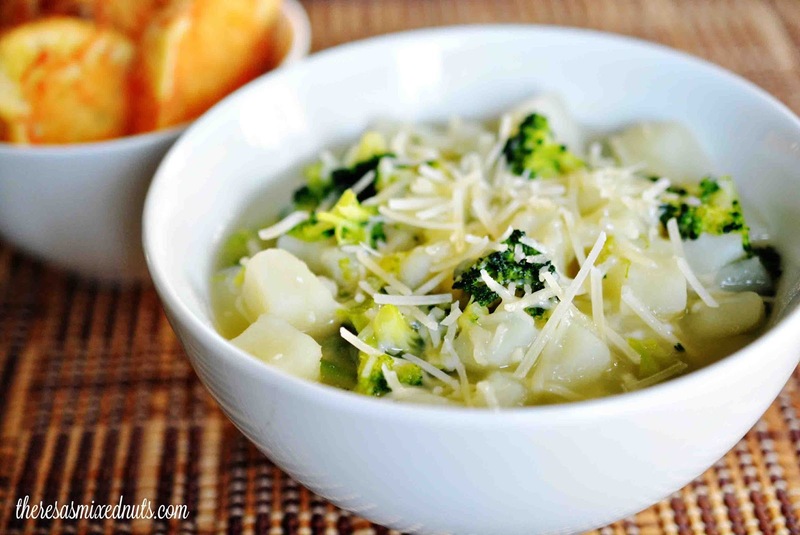 We love potato soup, and we love broccoli soup, but we have never combined the two veggies into one soup dish. So, this Potato Broccoli Soup from Golden Blossom Honey looked like it was going to hit the spot today! With just a few ingredients, this soup can be whipped up in no time! It's a light, healthy soup, but I also think it would be fantastic turned into a cream based soup as well, if you don't mind the extra added calories. Served up with some toasted French bread, it's the perfect lunch or light dinner recipe. What's your favorite recipe to cook when you are stuck indoors? Broccoli is great, it has more calcium than milk does. When I'm stuck indoors I like to make Chicken Enchiladas. Chicken Enchiladas are so yummy! I haven't had them in a while, but I think I need to pick up some tortillas this weekend and fix that! We don't even have school buses here, we're expected to walk to school :( and ain't nobody cleans the streets on top of that. Oh, they sure do! But when summer rolls around, they also like to grumble when they have to make those snow days up in the warm weather. There is an interesting mixture. Ugg, mother nature keeps changing back and forth. Flip flopper she is. I am starting to hate Mother Nature. She can never seem to make up her mind! I love a nice warm soup when it is cold out. We have had some nasty weather so this would be very comforting. That looks yummy! You know, I've made potato soup, and I've made broccoli soup, but I've never tried potato broccoli soup before. It may be starting to warm up here but I am still all about the soups. I love how hearty this recipe seems to be! Some added extra calories aren't always a bad thing! These are gorgeous photos and I can't wait to try the soup! I love potato soup and my mom likes to throw broccoli in hers for good measure. The weather here in Michigan has been awful the last week and we have another storm coming. What a way to boost up a potato soup. I think it's yummy and will have to make it. Broccoli is my all-time favorite veggie, so this recipe is calling to me. I hadn't considered pairing it with potatoes, but it looks incredible! This looks really delicious! I've never actually made potato and brocoli soup so it's perfect timing! Looks really good! What a surprise that honey is an ingredient for this soup! I am drooling. I Love hearty soups like this! NOM. Yum, my favorite! I love your photo too! That looks amazingly delicious, and would be hearty during the winter weather. What a great new recipe to make soup. Need to try this on the weekend.